Amanda McBroom and George Bell perform Brell in the Berkshires. Giuliano photos. McBroom on stage upstairs at Spice Dragon’s Cabaret,. Meeting with fans after the show. George Ball has performed Brel for some four decades. McBroom and Astrid Hiemer discuss the music of Jacques Brel. 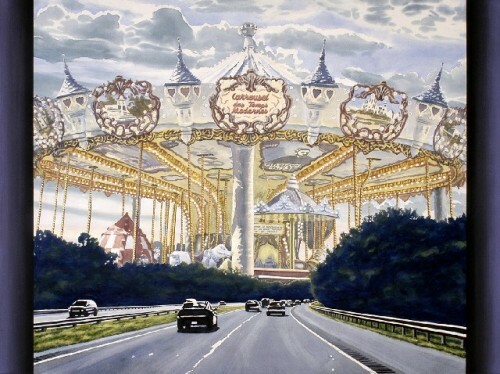 French Carousel Over Mass Pike, on exhibit Robert Morgan:Very Large Watercolors, McCoy Gallery at Merrimack College, MA, Sept. 4-Oct.9, 2012. Photo:Morgan. If you have not heard Jaques Brel’s chansons or Amanda McBroom and George Ball lately, this year’s Berkshire opportunity is only happening today and tomorrow. Hurry, you will love the music, the chansons and the performers! George Ball has been singing ‘Jaques Brel is Alive and Well and Living in Paris’ for 40 years. 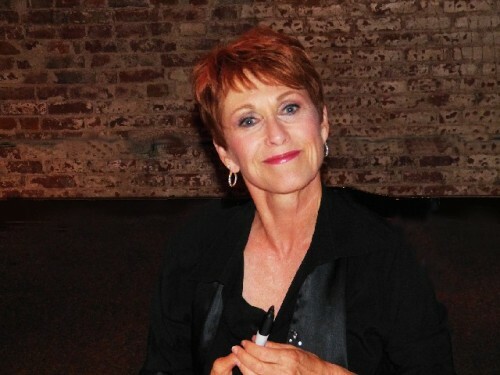 Amanda McBroom joined him and the company in Los Angeles approximately 30 years ago, after having seen the cabaret performance fourteen times and had called him as often, until he invited her to audition. They, but more often he has performed Brel all over America more than 1000 times and we just experienced it for the first time last night! Of course, we have been aware of the cabaret version for years and I have partially resisted, because I had loved and listened to Brel’s records in France and Germany, while I was still living in Europe. I used to be a true Francophile. I know the songs so well and thought that an American version cannot equal the real thing. Wrong! Granted, they are not Jaques – but their music, the translations are as complex and true to the French and Flemish chansons. Their renditions are light and lovely as well as intense and gut wrenching. That’s Brel! 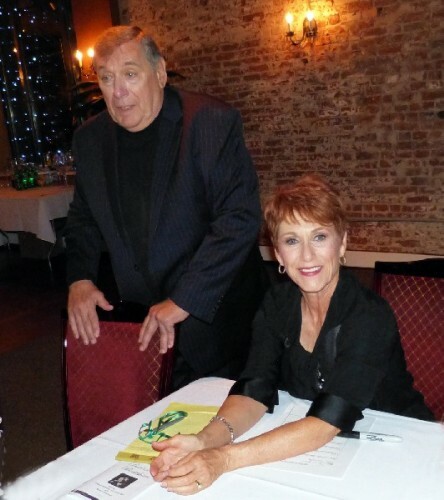 And that’s Amanda McBroom and George Ball! The duo, accompanied by the very accomplished Michele Brourman as Music Director, started slowly with ‘You Don’t Forget’ as a duet. Then they took turns performing love stories, Brel’s sweet and bitter-sweet life and chansons, individually or sharing a song in phrases. They sang: 'Madeleine,' 'Song for Old Lovers,' 'Fanette' and 'Matilde.' Ball’s rendition of ‘Amsterdam - dans le port d’Amsterdam….’ describes the sad life of a sailor in the harbor of Amsterdam, still looking for love among the prostitutes. ‘The Funeral Tango’ demands the toughest rendition, tango style. The protagonist derides hypocrites at a funeral, when they should have been real friends during a life-time. And ‘Early Morning Hangers On’ bemoans the endless night-life of a needy artist. Both were intensely performed by Ball. ‘Carousel’ starts slowly, while flying up and down in a carousel and ends in a frenetic word-fest describing movements and actions, the tread-mill of life! What a great metaphor, sung with amazing speed by McBroom. The trio presented 15 of Brel’s chansons and closed with McBroom’s own ‘The Rose’ to a standing room ovation. Later, I asked McBroom, whether ‘Jaques Brel is Alive and Well’ has been successful for 40 years, because of a known cabaret following in the US. She, however, thought that Brel actually reignited cabaret in America. How interesting! All three performers are well known for their many other accomplishments. 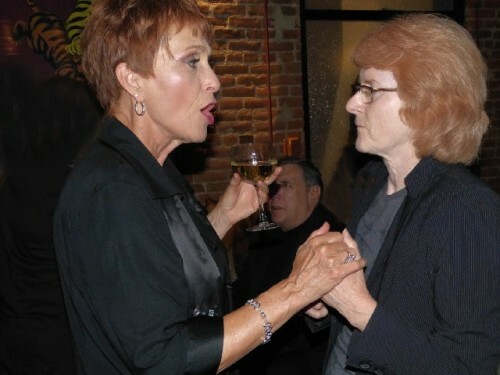 McBroom’s songs have been recorded by performers such as Bette Midler, Barbara Cook, Judy Collins. She has written two musicals, ‘Heartbeat,’ ‘Woman of Will’ and wrote the lyrics to a 2011 musical ‘Dangerous Beauty,’ with Brourman as composer. She has performed world-wide. 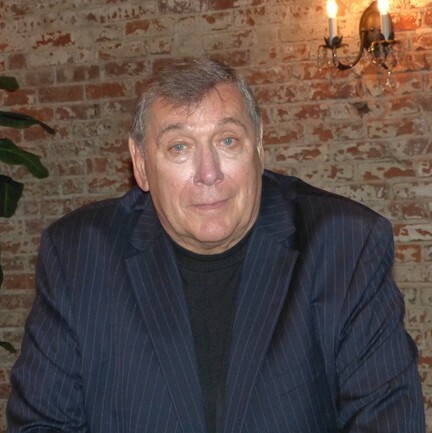 Ball’s list of accomplishments is not any shorter: He has had leading roles in ‘Best Little Whorehouse in Texas,’ Paint Your Wagon,’ ‘Brecht Sacred and Profane,’ ‘Man of La Mancha,’ ‘Harry Chapin….Lies And Legends,’ and many more. The couple lives in Los Angeles, California, where both have worked in television and have been nominated or received significant awards. Brourman has collaborated with McBride for many years. Their last co-production was ‘Dangerous Beauty' with Brourman as the composer. 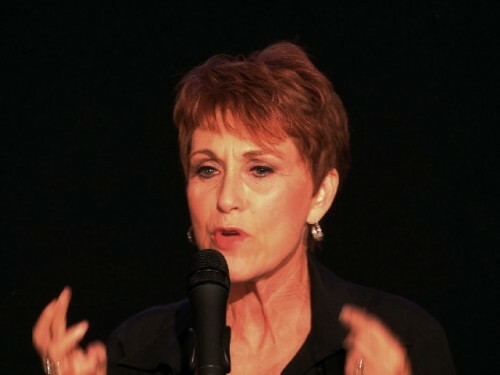 Many singers have recorded or performed her songs, such as: Michael Feinstein, Heather McRae, Rita Coolidge and, of course, Amanda McBroom. She has composed musicals in long and short-form and guided performers as Musical Director on stage. She has won awards and last, but not least, played piano in Bob Dylan’s band! Brel, the Belgian and raconteur par excellence, the story teller, who died in 1979, had first a large following in France and Belgium. Today, his music is known world-wide and his work is alive and well and lives on in America. "Loved the piece on jacque brell and those who carry his spirit. "